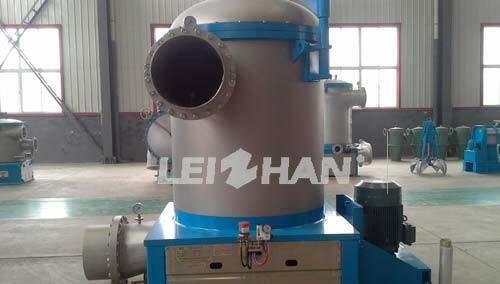 Inflow pressure screen mainly consists of machine shell, rotor, screen cylinder. Machine shell is made of stainless steel, well protecting the machine from rust, scratch, transformation and other equipment question. Rotor is the key device in inflow pressure screen machine body, it locates at the top of screen cylinder to keep the machine running. Leizhan adopts new type energy-saving VOKES rotor, which has a premium efficiency than usual rotor, strengthening fiber relief effect. Screen cylinder is a pulp fiber container, which allows accepted pulp pass through the screen hole or slot, and excludes impurities according to centripetal force. So the accepted pulp enter the screen cylinder and out by the accepted pulp pipe located at the bottom of the screen cylinder. Tailing pulp is excluded to the screen cylinder and out through the tailing pulp pipe located above the accepted pulp pipe. NLS Inflow pressure screen has the characteristic of high quality screening, big production capacity and low pulp pulse, which is fit for wood pulp, straw pulp and waste pulp fine screening. Besides, it is not only a paper pulp screener used in paper making process, but also an appropriate equipment for screening used before paper machine. What’s more, NLS inflow pressure screen has an automatic oil injection device and a seal water detection alarm device, ensuring the safe running of equipment and reduce maintenance.